The Disney Channel provided Cartoon Brew with this sneak peek of the main titles for Wander Over Yonder, their new series created by Craig McCracken. The main title theme song is written and performed by Two Man Gentleman Band, and the group’s banjoist Andy Bean is the composer of the series. 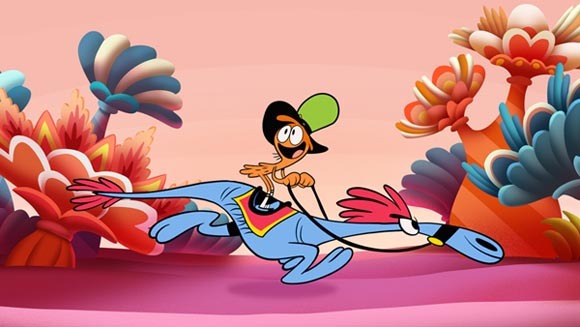 The Wander Over Yonder first-look telecast will premiere on Disney Channel Friday, August 16 (9:00 p.m., ET/PT), followed by the series premiere on Friday, September 13 (9:00 p.m. ET/PT). Bonus points if you spot the tribute to Ward Kimball’s Mars and Beyond! UPDATE: Joe Pitt has posted the rough cut of the Wander Over Yonder titles as well as credits for the sequence. He also wrote about the production of the piece on his Tumblr. This entry was written by kelvin, posted on July 31, 2013 at 4:00 am, filed under Animation. Bookmark the permalink. Follow any comments here with the RSS feed for this post. Trackbacks are closed, but you can post a comment.